Comedian Ricky Gervais hosted this year’s Golden Globes and promised he would push the boundaries as he hosted the awards ceremony for a second time. Ricky’s wit demonstrated that Americans really are lacking in the sense of humour department, and for that reason they deserve a Hollywood sized skelptarse! On the red carpet just before the ceremony he said “I think I’ll go just close enough to the edge but not go over it”. According to reports Gervais apparently disappeared for nearly an hour during the live ceremony. When he eventually returned he appeared to be less offensive, prompting a number of people to question what had happened to him. Had he been ordered to tone it down? Hollywood film producer Harvey Weinstein joked that Gervais would “not make it out of town” that night. The King’s Speech director Tom Hooper perhaps summed up the general feeling after the ceremony best: “I thought he was hilarious but will he ever present another award show again? I don’t know but if he went out, he went out burning”. Enough already, you guys need to lighten up and not take yourselves so seriously, grow a sense of humour after all That’s Showbiz! Well you precious, beautiful people, the floor is yours. Will you be able to resist the temptation to grab some limelight and explain your narcissistic, humourless behaviour? after Gervais apparently disappeared for nearly an hour during the live ceremony.When he eventually returned, he appeared to be less offensive, prompting a number of people to question what had happened to him. Had he been fired? Been given a telling off? Ordered to tone it down? “It was a big year for 3D movies. Toy Story, Despicable Me, Tron. It seems like everything this year was three-dimensional, except the characters in The Tourist. I already feel bad about that joke. I’m jumping on the bandwagon, because I haven’t even seen The Tourist. Who has? I’d like to quash the rumours that the only reason The Tourist was nominated was so that the Hollywood Foreign Press can hang out with Johnny Depp and Angelina Jolie. That is rubbish, that is not the only reason – they also accepted bribes. “There are seven people that we’ve hired to kill him and deservedly so. Knowing that Ricky Gervais will never work again means a lot to me, I’m going to make sure of it,” he told journalists backstage. But some attendees endorsed the comic’s jokes. 30 Rock star Alec Baldwin was spotted wiping tears from his eyes throughout the ceremony, and lifetime achievement winner Robert De Niro was also seen laughing all the way through. US critics were not kind in their review of Gervais’s “performance”. “It would not have been surprising to see a hook emerge suddenly stage left or to learn that the host had taken ‘suddenly ill’,” she added. The New York Times said the comic was “merciless from the start” while the Hollywood Reporter said it would “undoubtedly be his last hosting gig for the Hollywood Foreign Press Association (and, who knows, maybe any Stateside awards)”. 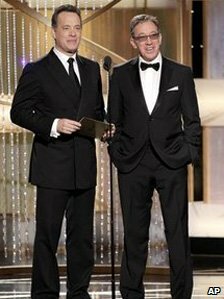 Facebook film The Social Network and TV show Glee are the main winners at the Golden Globes in Los Angeles, where British actors Colin Firth and Christian Bale are also honoured. What’s life like for a man at home with the kids? diagnosed as such if the problem persists and is recurrent. Checkout this site for more Buy Sildenafil Tablets Online.